Home Games New Resident Evil 2 Leon and Claire gameplay trailers are terrifyingly good! New Resident Evil 2 Leon and Claire gameplay trailers are terrifyingly good! Plus, you can watch Ada Wong in action! A few days ago, leaked screenshots of the upcoming Resident Evil 2 remake surfaced online, showing off more of the game’s monsters and even a look at Ada Wong’s new design. Now, Capcom has officially released not only screenshots, but more gameplay footage of Claire and Leon in action! The new gameplay videos seem to be the source of the leaked screenshots as the footage shows Leon and Claire fighting off new enemies, and even some shots of Ada Wong in action. 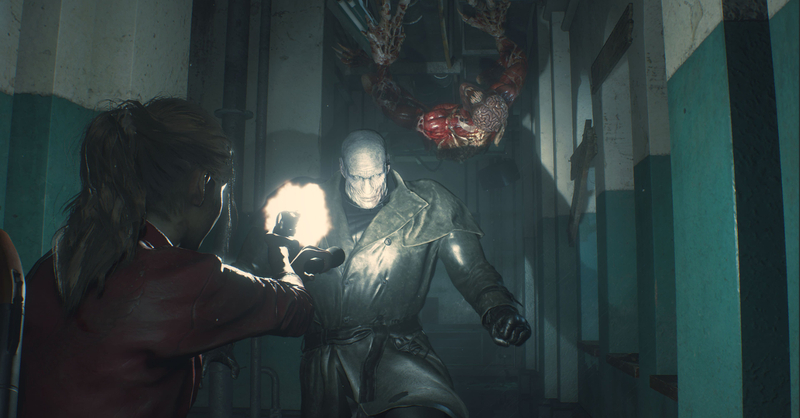 This new video shows Leon fighting off enemies such as a monster that appears to be an even more grotesque Birkin. It also shows Leon’s encounter with gun shop owner, Robert Kendo (which goes much differently from their meeting in the original RE2). Finally, some gameplay footage of Ada Wong was revealed in the video, complete with a quick demo of her EMF device. Claire’s gameplay video is quite intense as she goes head-to-head with the ‘Unstoppable Tyrant’, an enemy that’s nigh-invincible. It seems that players won’t be able to kill off the Tyrant easily, even after pummeling him with bullets. Aside from Claire’s encounter, the video reveals that there will be parts of the game where Sherry Birkin is playable. The Resident Evil 2 remake will be released on January 25, 2019 for PS4, Xbox One, and PC. Interested in more RE2 content? Check out Datablitz and Capcom’s recent media preview of the game featuring RE2 producer Tsuyoshi Kanda.